It has been suggested that PNG solution be merged into this article. (Discuss) Proposed since March 2019. The Pacific Solution is the name given to the Government of Australia policy of transporting asylum seekers to detention centres on island nations in the Pacific Ocean, rather than allowing them to land on the Australian mainland. Implemented from 2001 to 2007, it had bipartisan support from the Coalition and Labor opposition at the time. The Pacific Solution consisted of three central strategies: thousands of islands were excised from Australia's migration zone or Australian territory, the Australian Defence Force commenced Operation Relex to intercept vessels carrying asylum seekers and the asylum seekers were removed to detention centres in Nauru and Papua New Guinea while their refugee status was determined (although the Papua New Guinea centre closed in November 2017). A number of pieces of legislation enabled this policy. The policy was developed by the Howard Government in response to the Tampa affair in August 2001, and was implemented by then Australian Immigration Minister Philip Ruddock on 28 September before the 2001 federal election of 24 November. The policy was largely dismantled in 2008 by the Rudd Government following the election of the Labor Party; Chris Evans, the Minister for Immigration and Citizenship described it as "a cynical, costly and ultimately unsuccessful exercise". In August 2012, the succeeding Gillard Government (Labor) introduced a similar policy, reopening Nauru Regional Processing Centre and Manus Regional Processing Centre for offshore processing, and on 19 July 2013, newly returned Prime Minister Kevin Rudd announced, "asylum seekers who come here by boat without a visa will never be settled in Australia", striking a Regional Resettlement Arrangement between Australia and Papua New Guinea, to divert all "unauthorised maritime arrivals" to mandatory detention on Manus Island with no possibility of attaining Australian residency. The Australian Government passed legislation on 27 September 2001, with amendments to the Commonwealth Migration Act (1958). The implementation of this legislation became known as the Pacific Solution. By redefining the area of Australian territory that could be landed upon and then legitimately used for claims of asylum (the migration zone), and by removing any intercepted people to third countries for processing, the aim was to deter future asylum seekers from making the dangerous journey by boat, once they knew that their trip would probably not end with a legitimate claim for asylum in Australia. On 28 October 2001, at his 2001 election campaign policy launch, Prime Minister John Howard said "we will decide who comes to this country and the circumstances in which they come" in an effort to build support for the policy. Asylum seekers were intercepted at sea while sailing from Indonesia and moved using Australian naval vessels. Detention centres were set up on Christmas Island, Manus Island in Papua New Guinea, and on the island nation of Nauru. Some were also accepted for processing by New Zealand. Most of the asylum seekers came from Afghanistan (largely of the Hazara ethnic group), Iraq, Iran, China, and Vietnam. The last asylum seekers to be detained on Nauru before the end of the policy had come from Sri Lanka and Myanmar. Arrivals dropped from a total of 5516 people in 2001 to 1 arrival in 2002 after implementation of the policy, and remained below 150 annually until 2008. The removal of the Taliban from power in Afghanistan may have had some effect in this decrease, as nearly six million Afghans had returned to Afghanistan since 2002, almost a quarter of the country's population at the time. A lower level of boat arrivals continued throughout the Pacific Solution period, and it has significantly peaked in numbers since the abolition of the policy, despite worldwide asylum claim numbers remaining low by historical standards. These arrivals have also corresponded with increasing numbers of new refugee arrivals in Indonesia after the abandonment of the policy: 385 in 2008, 3,230 in 2009, 3,905 in 2010, 4,052 in 2011, 7,218 in 2012 and 8,332 in 2013. A probable link between restrictive refugee policies and lower attempts at seeking asylum in Australia by boat have been confirmed by the UNHCR: in April 2014, UNHCR Indonesia representative Manual Jordao stated: "Word that the prospects of reaching Australia by boat from Indonesia are now virtually zero appears to have reached smugglers and would-be asylum seekers in countries of origin such as Afghanistan, Iran, Pakistan and Myanmar. The numbers registering with the UN Refugee Agency (UNHCR) in Indonesia have dropped from about 100 a day during 2013 to about 100 a week now." Four boats were successfully returned to Indonesian waters out of the twelve Suspected Illegal Entry Vessels (SIEVs) intercepted by the Navy during Operation Relex during 2001–2002, having made 10 attempts to enforce the policy, based on judgements of whether it was safe to do so or not. Three men allegedly drowned trying to swim back to shore after returning to Indonesia. In November 2003, a boat carrying 53 passengers was successfully deterred, and in March 2004, Customs returned a boat with 15 people after interception at the Ashmore Islands. The success rate was 36 per cent of boats, or 31 per cent of asylum seekers sent back to Indonesia. Details of operations from 2005 to 2008 are scant. Operation Resolute began in July 2006, run jointly by the Australian Customs and Border Protection Service and the Australian Defence Force. 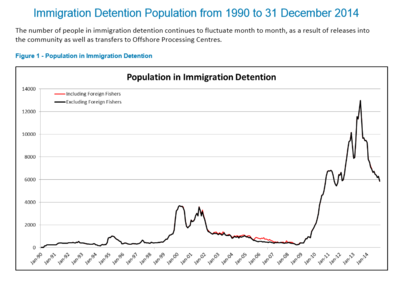 During the Pacific Solution period, mainland detention centres were closed at Baxter, Woomera and Curtin. The number of asylum seekers assessed as genuine refugees via the Pacific Solution process was lower than for onshore processing. 68 per cent of the asylum seekers were deemed genuine refugees and less than 40 per cent of asylum seekers sent to Nauru received resettlement in Australia. A 2006 report by the Australian Human Rights Commission showed that of the 1509 asylum seekers sent to Nauru by that time, 586 were granted Australian resettlement (39%), 360 resettled in New Zealand (24%), 19 resettled in Sweden (1.2%), 10 in Canada (<1%) and 4 in Norway (<1%). A total of 482 asylum seekers (32%) were deemed not genuine refugees and sent home. The cost of the Pacific Solution between 2001 and 2007 was at least $1 billion. Amnesty International, refugee rights groups and other non-governmental organisations said that Australia was failing to meet its international obligations. The ad hoc nature in which the policy evolved was also criticised, as it resulted in people being moved to Manus Island and Nauru before facilities were ready. Poor facilities and services including intermittent electricity and fresh water, poor medical facilities and the serious mental impact of detention on people in these conditions without the certainty of being granted refugee status were also strongly criticised. During the campaign for the 2007 parliamentary election, Australian Labor Party leader Kevin Rudd promised to continue the Howard Government's policies of turning boats back to Indonesia and the issue of temporary protection visas. The last detainees left Manus Island in 2004 and Nauru in February 2008. The Republic of Nauru was concerned about losing much-needed aid from Australia. Opposition immigration spokesman Chris Ellison said the closure could suggest to people-smugglers that Australia was weakening on border protection. The Australian Government opened the Christmas Island Immigration Reception and Processing Centre in late 2008, and has since expanded facilities and accommodation there. In the 2012–2013 financial year the Government of Australia budgeted $1.1 billion to cover the processing costs for 450 arrivals per month. In May 2011, the Gillard Government announced plans to address the issue of asylum seekers arriving by boat with an asylum seeker 'swap' deal for long-standing genuine refugees in Malaysia. Refugee lawyers asked the High Court to strike down the deal, arguing that the Immigration Minister did not have the power to send asylum seekers to a country that has no legal obligations to protect them. There were calls on the Australian Government to reinstate the Pacific Solution by reopening the detention centres on Nauru. Several of these came from former outspoken critics of the policy. Refugee lawyer Marion Le, who had demanded the facility be shut down in 2005, said that it was "time for Labor to bite the bullet and reopen Nauru", while human rights lawyer Julian Burnside disagreed, but conceded that "Nauru [was] certainly the less worse, but both are unacceptable." This echoed the sentiment of Independent MP Andrew Wilkie who several days previously, while stopping short of calling for a return to the previous arrangement, noted that "John Howard's Pacific Solution was better." The Malaysian people swap deal was deemed unlawful by the High Court. During the 2010 Australian federal election campaign Liberal Leader Tony Abbott said he would meet with the President of Nauru, Marcus Stephen, to demonstrate the Coalition's resolve to reinstate the Pacific Solution policy, should he become Prime Minister. Prime Minister Julia Gillard announced 6 July 2010 that talks were under way to set up a regional processing centre for asylum seekers in East Timor. In August 2012, a government-appointed expert panel recommended a number of changes to the current policy including the reintroduction of the Pacific Solution after an increase in boat people and deaths at sea. This is expected to cost $2 billion over four years for Nauru and $900 million for Papua New Guinea. The bill to do so was passed on 16 August 2012. Asylum seekers who arrive by boat to Australia are now to be transferred to remote Pacific islands indefinitely while their claims to refugee status are being processed. The Government announced on 21 November 2012 that it was recommencing onshore processing with bridging visas. From now on, any asylum seeker who arrives in Australia by boat will have no chance of being settled in Australia as refugees. Asylum seekers taken to Christmas Island will be sent to Manus and elsewhere in Papua New Guinea for assessment of their refugee status. If they are found to be genuine refugees they will be resettled in Papua New Guinea... If they are found not to be genuine refugees they may be repatriated to their country of origin or be sent to a safe third country other than Australia. These arrangements are contained within the Regional Resettlement Arrangement signed by myself and the Prime Minister of Papua New Guinea just now. The subsequent Department of Immigration and Citizenship press release stated: "Australia will work with PNG to expand the Manus Island Regional Processing Centre, as well as explore the construction of other regional processing centres in Papua New Guinea...The arrangements [sic] also allows for other countries (including Pacific Island states) to participate in similar arrangements in the future." A new policy on boat arrival deterrence, Operation Sovereign Borders, was launched by the new Liberal–National Coalition on 18 September 2013. ^ "Flight from Nauru ends Pacific Solution". The Sydney Morning Herald. 8 February 2008. Retrieved 26 August 2013. ^ "Govt embraces Pacific Solution measures". The Australian. 13 August 2012. Retrieved 17 June 2013. ^ "Kevin Rudd to send asylum seekers who arrive by boat to Papua New Guinea". The Sydney Morning Herald. 19 July 2013. Retrieved 26 August 2013. ^ "Regional resettlement arrangement between Australia and Papua New Guinea" (PDF). Australian Department of Foreign Affairs and Trade. Retrieved 26 August 2013. ^ a b "Regional Resettlement Arrangements" (PDF). Australian Department of Immigration and Citizenship. Retrieved 26 August 2013. ^ McKenzie, J. and Hasmath, R. (2013) "Deterring the ‘Boat People’: Explaining the Australian Government's People Swap Response to Asylum Seekers", Australian Journal of Political Science 48(4): 417–430. ^ a b "UNHCR Statistical Yearbooks 1994–2011". Retrieved 25 August 2013. ^ Janet Phillips & Harriet Spinks (23 July 2013). "Boat arrivals in Australia since 1976" (PDF). Research Paper. Parliament of Australia. Retrieved 25 August 2013. ^ "Human Rights Law Bulletin Volume 2". On 26 and 27 September 2001 the Commonwealth parliament passed migration legislation. Australian Human Rights Commission. Retrieved 11 June 2013. ^ "What was the 'Pacific Solution'?". the Howard Government introduced what came to be known as the 'Pacific Solution'. Parliament of Australia. Retrieved 11 June 2013. ^ UNHCR. "Welcomes close of Australia's Pacific Solution". United Nations High Commissioner for Refugees. Retrieved 22 November 2012. ^ "Liberals accused of trying to rewrite history . Australian Broadcasting Corp". Australian Broadcasting Corporation. 21 November 2001. Retrieved 22 November 2012. ^ "Boat arrivals in Australia since 1976". Parliament of Australia. Retrieved 26 July 2013. ^ "Speech by H.E Dr. Jamaher Anwary, Minister of Refugees and Repatriation, Afghanistan, to the International Conference on the Solutions Strategy for Afghan Refugees to Support Voluntary Repatriation, Sustainable Reintegration and Assistance to Host Countries, Geneva, 2 May. 2012" (PDF). UNHCR. Retrieved 25 August 2013. ^ "UNHCR Asylum Trends 2012" (PDF). Retrieved 17 September 2013. ^ United Nations High Commissioner for Refugees. "UNHCR – Indonesia Fact Sheet". UNHCR. ^ "Asylum seekers left high and dry in Indonesia". IRIN. ^ a b Jamieson, Amber (7 November 2011). "The consequences of turning boats back: SIEV towback cases". Crikey.com.au. Retrieved 26 August 2013. ^ Farr, Malcolm. "Turning back the boats? We should listen to the Navy". The Punch. Retrieved 26 August 2013. ^ "Operation RESOLUTE". Department of Defence. Retrieved 26 August 2013. ^ "Detention centres to be scaled down". The Age. Melbourne. 11 April 2002. ^ AHRC. "MIGRATION AMENDMENT (DESIGNATED UNAUTHORISED ARRIVALS) BILL 2006". AHRC. Retrieved 23 July 2012. ^ "a price too high: the cost of Australia's approach to asylum seekers" (PDF). Financial costs of offshore processing. A Just Australia, Oxfam Australia and Oxfam Novib. Retrieved 11 June 2013. ^ "Asylum seekers, the facts in figures". Crikey.com.au. 17 April 2009. Retrieved 22 November 2012. ^ "UNHCR welcomes close of Australia's Pacific Solution". UNHCR welcomes the end of Australia's Pacific Solution which comes to a close today. UNHCR. Retrieved 11 June 2013. ^ Maley, Paul (9 February 2008). "Pacific Solution sinks quietly". The Australian. ^ Topsfield, Jewel (19 December 2008). "Boat influx opens Howard's 'white elephant'". The Age. Melbourne. ^ Kerin, Massola and Daley (15 August 2012). "Boat arrivals a budget blowout threat". Australian Financial Review. Retrieved 16 April 2013. ^ "Malaysia Swap Deal For Asylum Seekers Ruled Unlawful By High Court". The Sydney Morning Herald. 31 August 2011. Retrieved 22 November 2012. ^ "Labor urged to revive Pacific Solution by refugee activists". The Australian. Sydney. 4 June 2011. ^ Jones, Gemma (31 May 2011). "Julia Gillard's asylum seeker solution damned by independent MP Andrew Wilkie". The Telegraph. Sydney. ^ "Malaysian swap deal ruled unlawful". The Sydney Morning Herald. Sydney. 31 August 2011. ^ Abbott to talk to Nauru on reopening camp, Yuko Narushima and Kirsty Needham, The Age, 8 August 2010. Retrieved 25 December 2010. ^ "Gillard's Timor solution: reaction". The Sydney Morning Herald. 6 July 2010. ^ "Australian parliament to vote on Pacific Solution". Radioaustralia.net.au. 14 August 2012. Retrieved 22 November 2012. ^ Bill Frelick, refugee program director (17 August 2012). "Australia: 'Pacific Solution' Redux". Human Rights Watch(Hrw.org). Retrieved 22 November 2012. ^ "First asylum seekers arrive on Manus Island". ABC. 21 November 2012. Retrieved 12 June 2013. ^ "Government reopens Pontville Detention Centre". ABC News. 21 November 2012. Retrieved 22 November 2012. ^ REGIONAL RESETTLEMENT ARRANGEMENT BETWEEN AUSTRALIA AND PAPUA NEW GUINEA.. Retrieved 26 July 2013. ^ "Transcript of Joint Press Conference". Commonwealth of Australia. 19 July 2013. Archived from the original on 26 July 2013. Retrieved 4 August 2013. Radio program "This American Life" featured a 30-minute story on Nauru, including the Pacific Solution. UNHCR note on Pacific Solution.